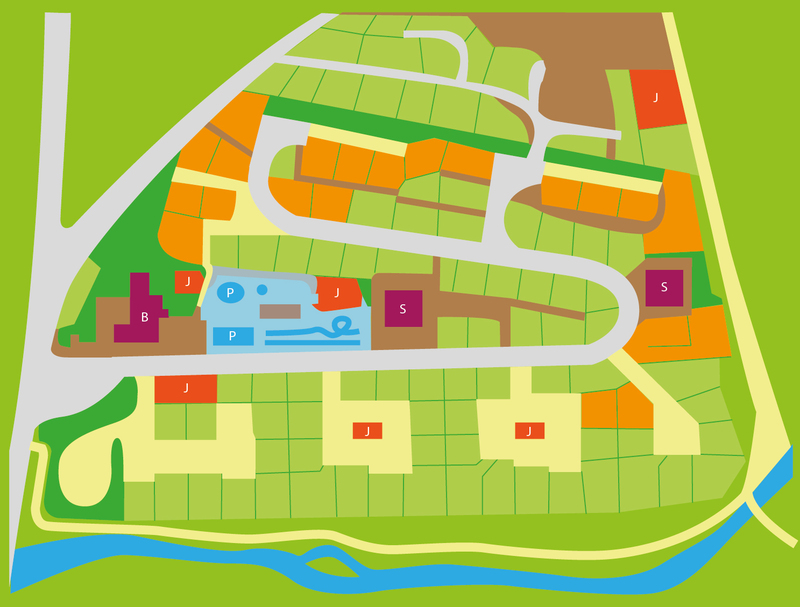 On this page you can visit all the different topics that campsite Le Clos Auroy has to offer. Have a look at all our possibilities for renting mobile homes for up to 6 people and also our water park that includes swimming pools, a jacuzzi and a children’s pool. Finally, you can discover all the advantages of the Auvergne region, where you can spend an excellent holiday with your family: nature, sports and, of course, discovering the local cuisine. Campsite Le Clos Auroy is set in the charming village of Orcet and in the department of Puy-de-Dôme. The campsite is located at exactly 250 meters from the centre of the village where you can find all neccesities. The campsite is approximately 300 metres above sea level, the village of Orcet is just 12 kilometers from the city of Clermont-Ferrand which is the capital of the Department of Puy-de-Dôme. The campsite is located in the heart of the Auvergne and is built alongside the Auzon, a beautiful small river along which you can walk. The access to the campsite is easy! Only 2 miles from junction 4 and 5 of the A75 motorway, follow the traffic signs Orcet and then the signposts to the campsite. 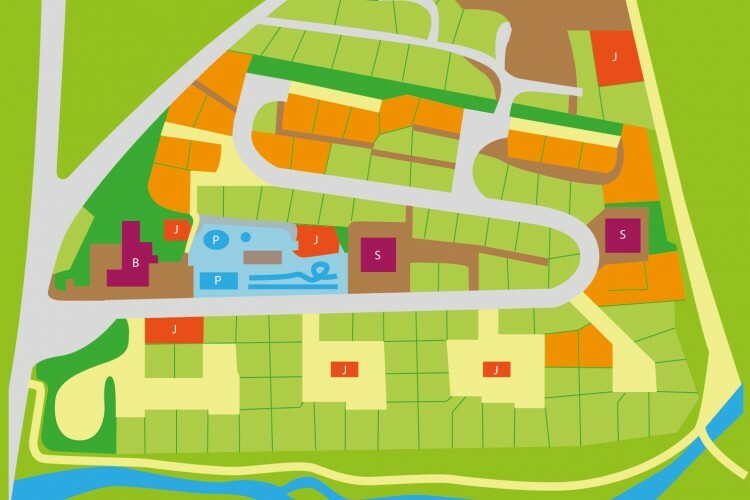 Campsite Le Clos Auroy has 85 pitches on four flat levels (2.5 acres). All pitches are separated by beautiful green hedges and are on average 100 square meters, each with an electric hook-up of 10 amp. Mainly with a (blue) European plug. If you do not have camping gear or if you prefer the comfort of a furnished rental unit, then you can rent one of our mobile homes. Our rental mobile homes, equipped with every form of comfort, are available for you on the premises. All camping sites are accessible for persons with reduced mobility. The washrooms with showers and toilets are accessible. The lower pool is wheelchair accessible but the upper pools are not yet accessible. There is no elevator to go into the water. A Euro relais terminal for motorhomes is available for the disposal of waste water and the filling of water tanks. Pets are permitted except in the rental accomodations, provided that they are tattooed and vaccinated. They must continuously be on a leash at the campsite and for going to the bathroom they need to go outside the campsite. The virtually new sanitary buildings are well distributed on the campsite and are easily accessible for everyone. The hot water is free. Washing machines and a dryer are available. During the colder days one sanitary block is heated. The entire campsite is illuminated at night. There is always someone of the Executive Board present; this is certainly essential in case of any problems. Wi-Fi access is available for all our guests for an additional fee, so you can check your emails or find information about activities in the Auvergne. There is a snack bar / bar where you can buy drinks, ice cream, candy, crisps, pizza and fries … You can also relax on the beautiful terrace with views of the swimming pools. Groceries at the bar are limited because there is a supermarket in the centre of the village at a distance of 250 meters. During high season you can pick up bread at the bakery each morning at the gate of the campsite. At the bar you can also buy ice blocks, frozen bottles of water and camping gas. You can also hand-in your own cooling-element that we will freeze for you. Our 4-star campsite meets all of the new European standards, including safety. For the winter period you have just outside the reception a “check inn” machine, with its possible to get on the site when there is nobody in the reception our when you come out of the openings hours. Before and after depending of the number of clients. Before and after depending of the number of clients and weather. Depending of the weather conditions they are to use, but with frost they are closed and only the ones inside the heated buildings are to use. But you could say they are open from 15-04 till 15-10. All the water on the campsite is drink water. The sanitair blocs are not the whole year round open. This is depending of the amount of persons then on the campsite and the weather conditions. Its then possible that are more or les buildings open. But there is always one open!